The Valley Fire has burned 67,000 acres and is still only 35% contained. The fire has killed two people and destroyed nearly 600 homes and hundreds of other structures in Lake, Napa, and Solano Counties. Governor Brown declared a state of emergency in Lake and Napa counties on September 14th. The Butte Fire has burned more than 71,000 acres and is 49% contained. On September 11th, the Governor declared a state of emergency in Amador and Calaveras counties. The Rough Fire is currently the largest fire in California, having burned nearly 140,000 acres. The fire is currently 40% contained. Some of these fires have been exacerbated by the bark beetle, which thrives when trees are stressed and leaves behind more dead, dry trees that are ready to go up in flames. To date, 7,344 fires have burned nearly 738,000 acres in California. Congress has indicated it will try to pass legislation this month that would address the nation’s increasing firefighting costs. A new report issued by the National Oceanic and Atmospheric Administration projects an increase in coastal flooding between now and April, as a result of higher sea levels and more frequent storm surge, compounded by the strengthening El Niño. 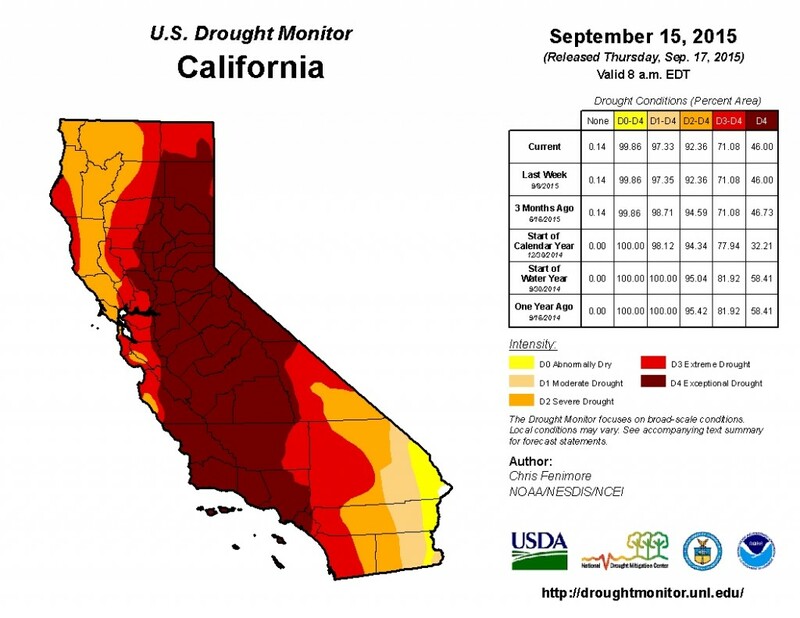 Speaking of El Niño…the U.S. Climate Prediction Center increased the probability that El Niño conditions will continue through the winter into spring 2016. In a paper published in the journal Nature Climate Change, scientists estimate that the amount of snow in the Sierra Nevada was the lowest it has been in more than 500 years. 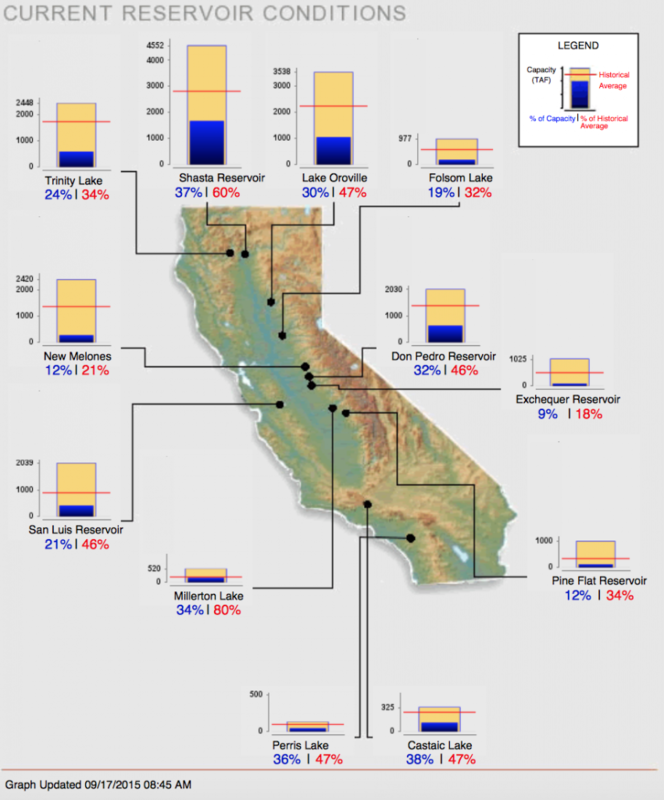 Statewide, California’s major reservoirs (representing 27.3 million acre-feet of storage) are at 29% of capacity and 49% of group average.